I hope that everyone has enjoyed the lovely Queens birthday long weekend! What a lovely weekend it has been! I have, along with the usual domestic chores, spent a little time in my scraproom. Here are the pages that I created. These first 2 are my takes on the monthly challenges at the SCRAPSIDAISY forum. If you would like to take part feel free to join in. The Criteria was simple - Use a diecut paper. This last page (above) I used the "NEW" Ruby-Rockit. Vintage Beauty! It is a lovely range & is all available from SCRAPSIDAISY . Speaking of Scrapsidaisy! 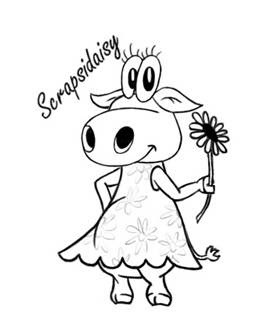 Leisa is celebrating at the moment as SCRAPSIDAISY is turning 4! 4TH BIRTHDAY CELEBRATION Card Competition. Part of our celebrations will be a "Make us a Birthday Card" competition! All you have to do is make and send us a 4th birthday card. We will choose 2 cards we like the best and the creators will receive a prize pack of scrap goodies worth $50 each! One entry per person please. Just send your card to us at 107 Isabella Street, Wingham NSW 2429 AND if you mention this competition and link us on your blog (let us know you have done it in the comments section so we can visit) we will put you in the draw to win a special blog candy pack worth $30! So be sure to head over to the Scrapsidaisy Blog & enter for your chance to win.